Our third day in Hong Kong was a short one as the all-aboard time was 3:00PM. Immigration requirements are very strict and we needed to have two hours for the local officials to clear the ship prior to our sailing at 5:00PM. We met up with our friend, Jenn, this morning to visit the Junk Bay Cemetery, Hollywood Road and spots in between. We took the subway about 30 minutes to a suburb where the cemetery was located. We came out of the subway station and found the sign pointing the direction to the cemetery but we were unable to find the path leading to the cemetery. We asked many locals who claimed not to know where it was or did not speak English. It took us nearly an hour to find someone to lead us in the correct direction and to find the path to the cemetery. The path ended up being a very wide concrete pedestrian only path which took us on a 20 minute hike up hill, in the heat and humidity, to finally reach the enormous cemetery. 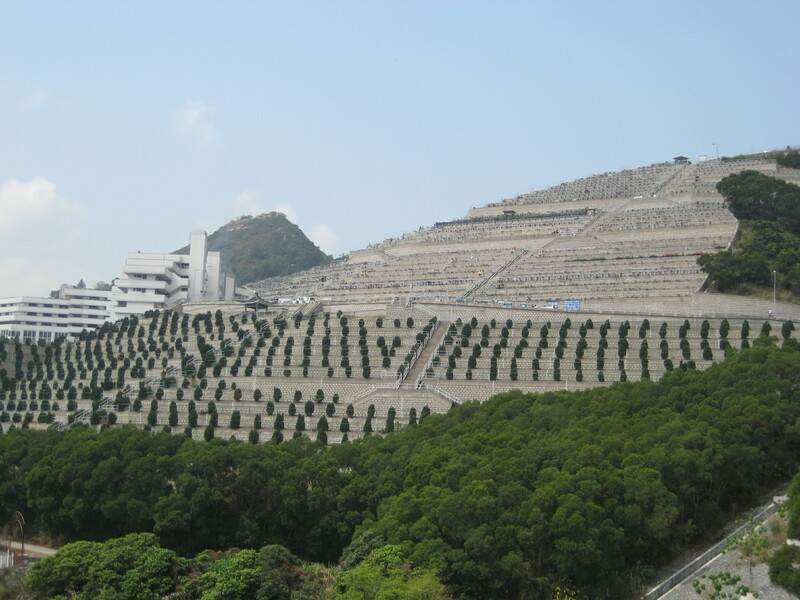 An entire vast hillside is terraced with row after row of graves, each one just like the one next to it. It was fascinating to see but somewhat disappointing that the individual headstones were all the same. It was also disappointing to find out once we reached the cemetery that we should have tried to find a cab which would have saved us the uphill climb and getting lost. Our friend, Jenn, tired before we reached the cemetery so we went ahead without her and came back an hour or so later to pick her up. Next we headed to Hong Kong Island and Hollywood Road, which is known for its antiques shops. Kent was disappointed because it was not how he had remembered it in the past. The once junky looking shops with tons of old trinkets have been replaced with very high-end shops with high prices. We then wound our way down hill towards the Star Ferry, stopping for a snack before crossing the harbor on the ferry back to Kowloon and the ship. As we sailed out or Hong Kong, many of the guests were out on deck to enjoy the view and Barbara’s commentary about what we were seeing as we left the harbor. It was an enjoyable three days but not near long enough to see everything that Hong Kong has to offer. The entertainment was Ryan and Ashleigh Di Lello, finalists on So You Think You Can Dance show. They have also performed as guests on Dancing with the Stars. They are in extraordinary shape and their dancing was crisp, fast and the best dancers we have had perform onboard so far. This entry was posted in World Cruise 2013 by markcujak. Bookmark the permalink.